Hello everyone! How is your week going so far? I've got a new outfit post for you, yay! It's from when I was in Prague a few weeks ago, visiting one of my most favorite places there - The Vyšehrad fort. This beautiful part of the Prague skyline is a great place to check out when you are in Prague and it's only a few metro stations from the centre. You get a perfect view of Prague Castle and historical Prague from the walls of Vyšehrad. You can just come to hang out, relax, read a book between the blooming trees (we lucked out with timing of the year), have a lunch or dinner in the restaurants near by, visit an old cemetery where some of the most influential people are burried (famous Czech writers, musicians etc.). Coat - Japanese Thrift Store in Sapporo, jeans - Tally Weijl, ombré top - Gate, shoes - F&F, tourquise bag - Italian markets, scarf - Cropp. You look just like a dool ! Ohmygosh I want this coat so much. It is way too cute! And wow-teach me how to make that flower crown. That is soo beautifully made! You look wonderful in pastels, the ombre top is really fun! All of these photos are also very beautiful! This is so beautiful love it. You look gorgeous and amazing pictures too. These are really great photos! You look so pretty by this pink door too! That jacket is adorable on you. Love the colours on you! Love this look and gorgeous photos! Pastel colours are the best! Sweet jacket and beeautiful locations! Hey girl!! I just happened to stumble upon your blog and am really lovin your style! these pics are gorgeous and you look flawless! 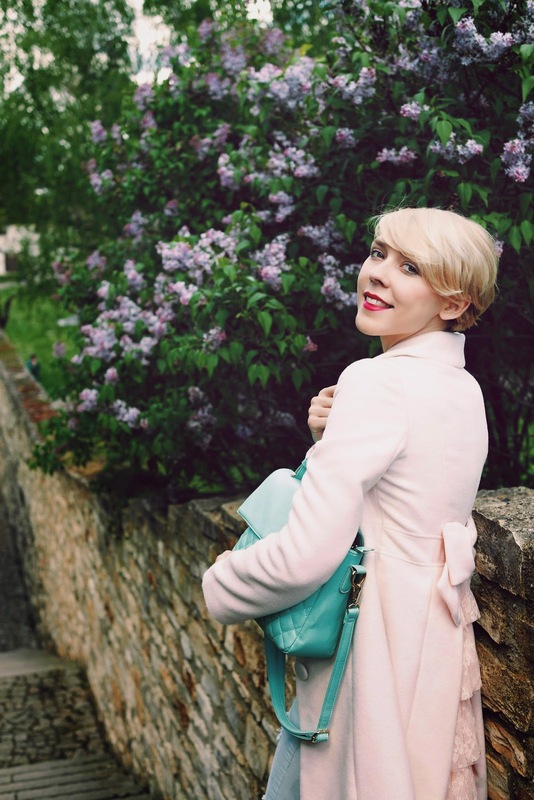 You look fabulous and I adore that pink coat with the bow at the top of this post! Amazing pics and look... I love your adorable coat!!! You look great in these soft colors, doll! Great post dear...lovely pics..:-) You look so adorable! Wow every photo gets more beautiful! Cute outfit! I hope you're enjoying your time! Your coat is super coat and the pics are amazing! Beautiful outfit!! You look so pretty in pink, and I love the red lips! Happy Friday!! The bow and lace on the back of your coat is super kawaii. Absolutely love your coat, the details at the back is so lovely! What lipstick are you wearing here? The shade is stunning on you! Oh MY!! Great photos! I've never been in Prague but dream about going there!!! Incredibly beautiful place! And by the way, red lipstick looks just perfect on you! That is one fabulous coat and I am so happy that you finally got to enjoy it and wear it. What a deal at only $4! I can't see how anyone would pass that up! You look amazing in it! You pictures are gorgeous!